Every so often, I'll look through my recipe archives for a specific classic go-to recipe, only to discover that it's not there because, oops, I never posted it. What the hay!! How does this keep happening?? Well, after 11 years and nearly a THOUSAND recipes, (yes really!) I guess it's hard to mentally keep track of every recipe I've ever posted! 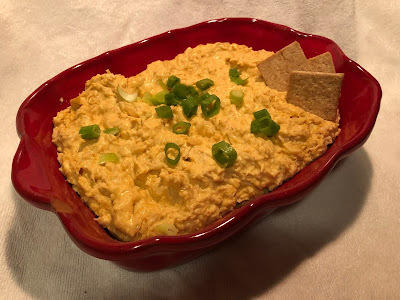 So, after going to my sister Patty's house for dinner and having some of my niece Tory's fabulous Buffalo Chicken Dip, I thought this would be PERFECT for the group hang that I was planning. But, you guessed it, I looked in the archive and it was nowhere to be found. OK! I guess it's time fix that! So, thanx, Tory, for texting me the recipe, but as usual, I tweaked it ever so slightly. I used more chicken than she said to use, because well, more is more! And Full Disclosure: I'm not really a fan of the usual hot sauce typically used on Buffalo Chicken Wings. Frankly, it's been years (probably decades) since I've eaten wings, and chances are I asked for the hot sauce to be served on the side. What can I say? It's just not my favorite thing. So when I started making this dip, I decided to swap out the hot sauce for Sriracha, which I think has a MUCH better flavor. My friends LOVED it! But we decided that it kind of no longer tastes like Buffalo Chicken. This one is BETTER! Hence the name. So there you have it. It has great flavor and just enough heat that doesn't smack you in the face. Actually, it's really more of a slow burn that sort of sneaks up on you, which is not necessarily a bad thing. Now that this is officially posted, I think I might keep it in the rotation for a while! My friends loved it, and I bet yours will too! Mix everything together, pour it into a small baking dish, then either heat it up in the microwave or bake it in the oven until it's all melty. Serve with Wheat Thins, Scoops chips, or celery sticks. I think by now you know what I'm gonna say. If you like a lot of something, add a lot! Do you LOVE Sriracha? Add a lot! Do you LOVE Ranch dressing? Add a lot! And if you love the usual hot sauce instead of sriracha, go for it! You do you! I used canned chunk chicken, but if you have leftover cooked chicken or rotisserie chicken, just finely shred it and use it up!